srI rAmAnuja had expounded on bhakthi yOgam (path of bhakthi or devotion) in his treatise srI bhAshyam, to attain mOksham (liberation from materialistic realm) . This was meant to counter the hypothesis put forward by kudrishtis (those who give wrong interpretation of the vEdhas) who had said that only gyAna yOgam (path of knowledge) would lead to mOksham. srI rAmAnuja was concerned that his followers would also think that bhakthi yOgam only would liberate them from this samsAram (materialistic realm) and would follow that to attain mOksham. In SaraNAgathi gadhyam, he emphasises on saraNAgathi (surrendering to srIman nArAyaNan) as a path to attain mOksham. One may ask, if saraNAgathi is the path to mOksham, why then did he not expound this in his srI bhAshyam to counter the kudhrishtis? The reason for this is that just as a brAhmaNa can not teach vEdha to a chathurtha varNika (4th class of people), one can not let out the sacred, rahasya (secretive) meanings of SaraNAgathi to everyone openly. In what way is SaraNAgathi superior to bhakthi yOgam as a means for attaining mOksham? bhakthi is limited to thraivarNikas (persons belonging to the first three varNas, viz., brAhmaNa, kshathriya and vaisya and even in these three classes, the males only) whereas SaraNAgathi can be carried out by anyone without any distinction. bhakthi is a difficult method to follow while SaraNAgathi is very simple. bhakthi gives results after the person who follows it exhausts all his prArabdha karmas (karmas, or deeds, are of two types, sanchita and prArabdha; sanchita karma is the sum total of all the karmas that the jIvAthmA (soul) had earned while being born repeatedly. prArabdha is that which God takes out as a portion from the full bundle of sanchita and lets the jIvAthmA to complete in a set of births in its term in the samsAram following the pApa / sin and puNya / virtue karmas with which it was sent to this earth). SaraNAgathi yields results in the same birth in which the AthmA had performed SaraNAgathi. While following the path of bhakthi, one has to be very careful in not transgressing what is told in vEdhas. However that is not the case with SaraNAgathi as it is very simple to perform. One has to take lot of efforts to carry out bhakthi while in the case of SaraNAgathi, it is readily available for practicing. bhakthi is not synchronous with the svarUpam (characteristics or basic nature) of AthmA while SaraNAgathi is. In other words, the svarUpam of AthmA is to be subservient (sEshabhUthan) to SrIman nArAyANan as well as to be dependent (pArathanthriyan) on him and these are fulfilled while following SaraNAgathi whereas bhakthi is attained through the self-efforts of AthmA which is not the svarUpam of AthmA. And, bhakthi is not a match for the result which is attained while SaraNAgathi is. SaraNAgathi is also mentioned in vEdhAntha. In yAgyikIya upanishad, twelve different characteristics are mentioned for a jIvAthmA and the highest place among the twelve is given to SaraNAgathi. It has been followed by pUrvAchAryas also and is dear to the heart of SrIman nArAyaNan. Thus, being acceptable to vEdhAntha, being aligned to the swarUpam of jIvAthma, having been followed by AzhwArs and pUrvAchAryas and being close to the heart of SrIman nArAyaNan, made srI rAmAnuja to expound it so that his followers would also be benefited by it. He chose the panguni uthram day for performing SaraNAgathi when namperumAL and ranganAchchiyAr were seated next to each other. All the hurdles of samsAram were constantly going through in his mind and in order to get rid of these, he surrendered to the divya dhampathi. He had performed SaraNAgathi earlier when he took samAsrayaNam under his AchAryA periya nambi. While SaraNAgathi is to be performed only once, why did srI rAmAnuja perform it a second time? It was because of the fear that the samsAram was creating as well as the strong urge to be with God soon. Even AzhwArs performed SaraNAgathi repeatedly (nammAzhwAr did it 5 times and thirumangai AzhwAr, 10 times). Same is the case with AchAryas too. Hence in order to get rid of samsAram and to reach SrIvaikuNtam to perform kainkaryams (service) to the dhivya dhampathi he carried out SaraNAgathi. We shall now move on to the 1st chUrNai of this treatise. 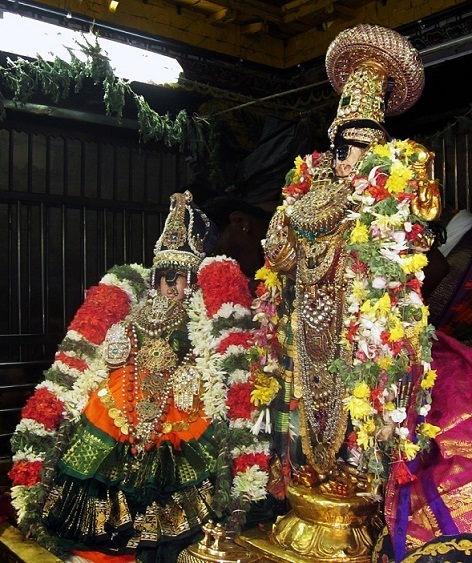 This entry was posted in gadhya thrayam, Other, SaraNAgathi gadhyam on November 26, 2015 by T N Krishnan.